Your garage door is a finely tuned machine that guards your home, your possessions and, most important of all, your loved ones. Without regular maintenance, your house could be exposed to home invasions and, rather than guarding your house and belongings, your garage could pose a serious safety risk. When you call in our professional technicians, you are ordering the highest quality maintenance and repairs, but you will also get security, safety and peace of mind. Why Do You Need Professional Maintenance? Most people wouldn’t consider calling in our services while their garage door is working smoothly, but this is exactly what we recommend. Complete maintenance for your door on a regular basis is only a fraction of the cost of major repairs or replacement parts. When any part breaks, it will likely cause damage to other parts as well. For instance, if the door is left unbalanced, it can cause the cable to jump off the tracks and, in turn, cause the tracks to bend. As you can see, even delaying a simple realignment can domino into much more serious, and costly, damage to multiple door parts. When your door is not maintained properly, it means your home is insecure. Your garage is a main entrance point to your house for both your family and for potential burglars. Statistics show that in 2016, faulty garage security was the entrance point to almost 10% of all home burglaries in the USA. When your garage door is in proper working order, it becomes a formidable barrier to any home invasions. To make sure your home remains safe and secure, call our professionals to schedule a maintenance check at your earliest convenience. What’s Included in a Garage Door Maintenance Check? When our skilled service people arrive at your home, they will already have all the latest tools and equipment to perform a top quality maintenance assessment quickly and safely. -The balance and, if required, rebalancing the door. Call our service line to book an appointment today. 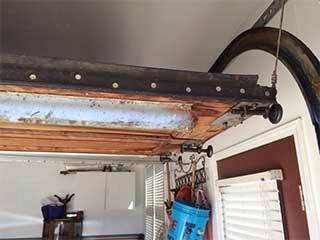 They may not look like it, but garage doors are complicated pieces of machinery. They need proper care to continue to work efficiently as they get on in years. That’s where we come in! From repairs and replacements to new installations, our professionals can handle it all for you. We also offer scheduled safety testing! Learn more here. Thank you for choosing Garage Door Repair San Marcos! One of our experts will be in touch soon. Feel free to browse our website for FAQ, tips and more useful information in the meantime!